Protein is needed for growth and development and is an essential component of a balanced diet. Find out why it is important to eat and enjoy a wide variety of foods each day. Some amino acids cannot be made by the body and must be supplied by the diet, known as essential amino acids. Protein foods can be provided from both animal and plant origin. Animal sources of protein tend to provide all the essential amino acids, known as a ‘complete’ protein. Plant sources of protein tend to provide different essential amino acids, so by eating a wide variety of these foods, you can get all the amino acids you need to make up a 'complete' protein from a vegetarian diet. A well balanced diet will provide enough protein for our bodies needs. Find out how how to get this nutrient into your food basket. Eggs and dairy such as milk, hard cheese, soft cheese and yogurt. Meat such as beef, pork, lamb and venison and poultry such as chicken and turkey. Fish including white fish, which tend to be naturally low in fat, and oily fish which provides the beneficial omega 3 fats. 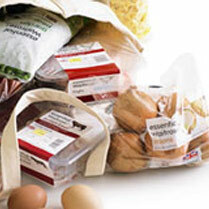 You will find a large selection of meat, poultry and fish at Waitrose. For fresh, quality cuts of your choice, visit our Meat and Fish Service Counters. Prepacked fish and meat products are available from our chilled and frozen cabinets. Pulses such as beans, peas and lentils. Soya beans and products made from soya such as tofu. Nuts and seeds such as brazil nuts, almonds, walnuts, pumpkin seeds and sesame seeds. Wholegrain cereals and cereal products such as wholemeal bread. Find out more about some of these foods and what makes them delicious and nutritious.